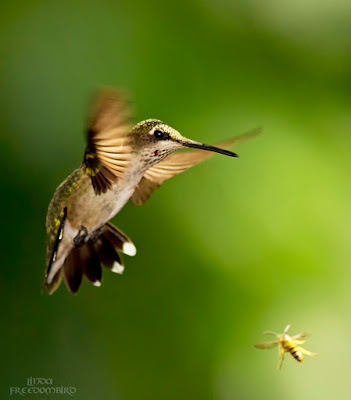 If you are looking at this post, you must like or love hummingbirds. During fall migration, natural flowers become scarcity in the North America, putting up nectar feeders will help these critter fuel up. I took these two shots few days ago at one of my feeders. Life is all about the survival games. When everyone wants the same thing, the bravest will ultimately win the battle. This world becomes a much better because all the nurture you gave and the sacrifices you made. To all the Mother in the world, Happy Mother's Day! Most people visit Berry College will definitely visit their famous Bald Eagle nesting site located just to the left from the main entrance. I spent a half day there not only because I wanted to watch eagles and their two eaglets, but also I loved to visit their forest, the largest college campus in the world! Surprisingly, I spotted a single Mute Swan! Mute Swan is native to central and northern Europe. I have seen Mute Swan in many continents mainly because human introduced these birds to zoos and parks. 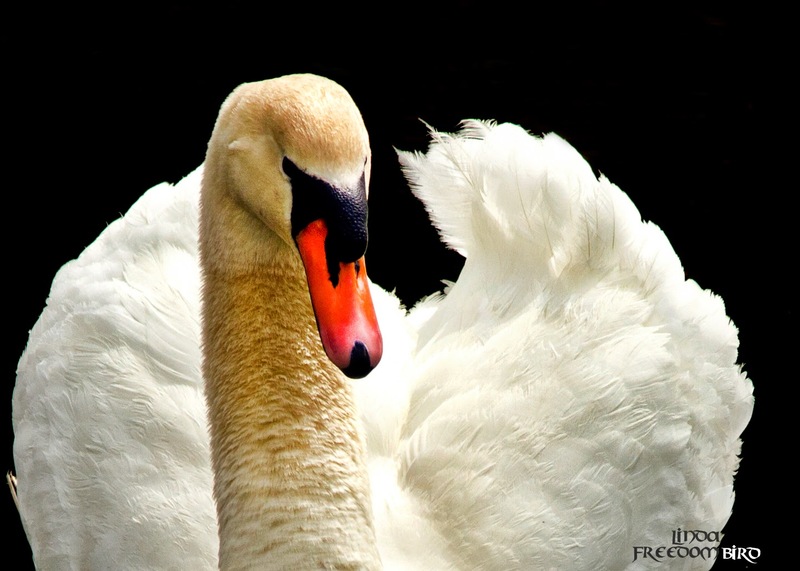 Mute Swans were introduced to North America in the late 1800. Escapees (lol, why don't they? They like to be free!) often establish their territory and become aggressive towards other wildlife. Mute Swans mainly feed on aquatic plant. In their native habitat, Mute Swan's long neck helps to bring up other vegetation deep in the water that other smaller waterfowl might have trouble to reach. 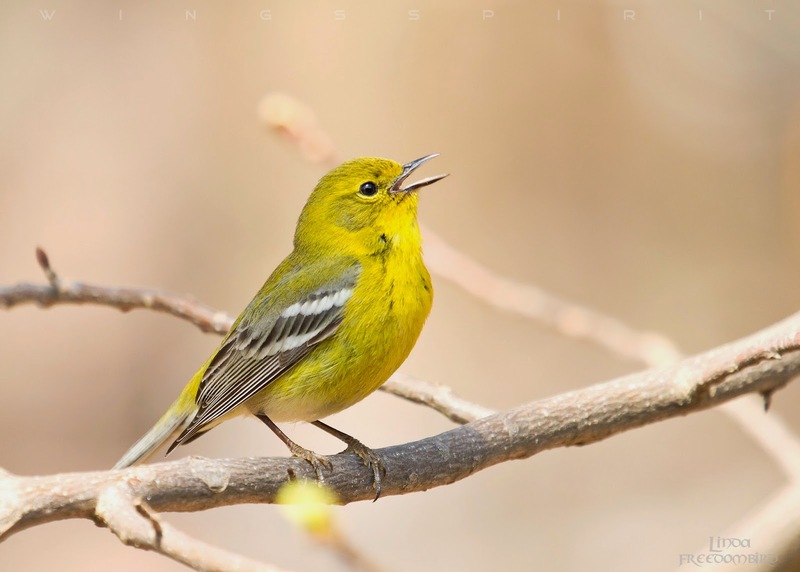 There are about 500,000 native birds in the wild and there are about 22,000 in United States. 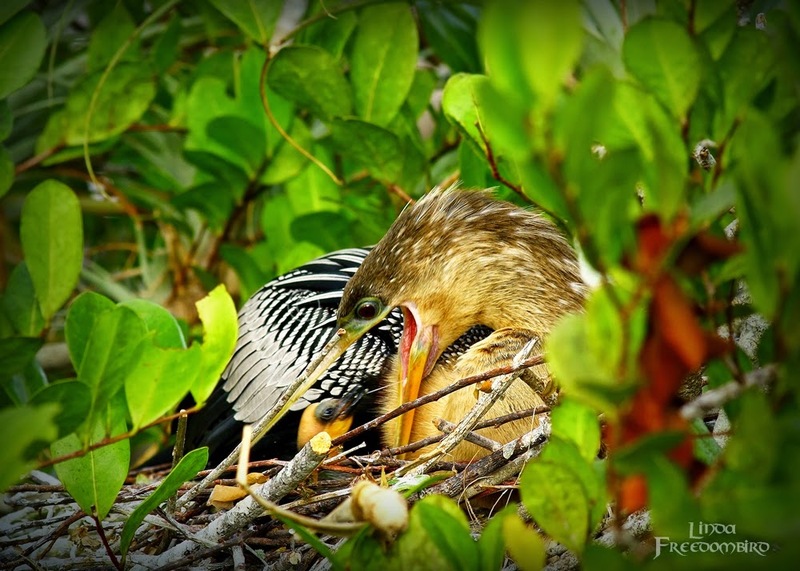 In a birder's point of view, they dislike anything invasive. However, there are many things in the world are evidently unavoidable. Living in a country with prominent four season makes everyone eager to welcome spring. I live in the southeast corner of United States. You might think weather must be perfect living in the south. Wrong. In the past few years, we had many snow storms and freezing roads during January and February. It's not a surprise if we have below freezing temperature in March. The first thing aroused my senses was hearing an Eastern Towhee singing in the first day of spring! What a beautiful morning to be awakened by the sounds of bird! I jumped out of bed and set up my camera and ready to capture their display. But it was still too early to photograph since this country started something called "Day Light Saving Time". The time has been "manipulated" by human to be one hour earlier than the real time, the purpose is to, hopefully, save some power usage. So I went ahead to enjoy a peaceful breakfast. 1. Some one replied that she got tired of buying live mealworms and from time to time, she will start a farm. My response is that you really need to have a "great" patient and dedication is the key, Actually dedication is the key to any thing we want to do in life to be successful. I have moved all my pupae into its own container. The bottom left photo is the first ten pupae after 6 days. The bottom right photo is a close-up photograph to show you one pupa (7 days in pupa stage) has become much darker, an adult soon perhaps? 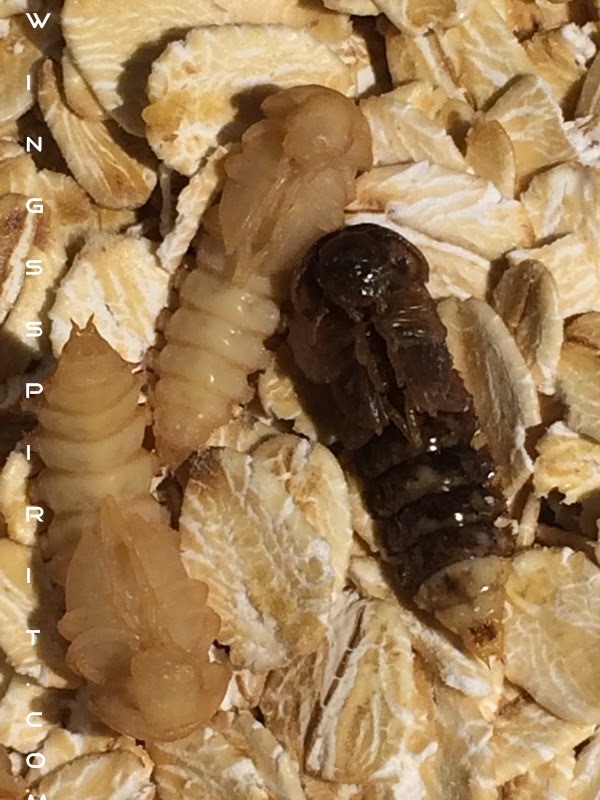 Pupae don't eat but I put rolled oats underneath them to make sure newly emerged adults have food. I do check them few times throughout the day. 3. One lady replied to my post and told me she gave her mealworms a slice apple or potato for the water source. I did a quick experiment with different vegetables, I found out organic carrot is the best choice. I never even eat apples unless it is organic because farmers here spread over ten times of pesticide to apples especially. For the things I don't eat, how will I feed my baby worms with them? My theory behind this is that commercial chemicals and pesticide might alter mealworms's genes more quickly if these chemicals are not strong enough to kill them in time. Human body is much bigger and can tolerate pesticides and preservatives much longer than a one inch long mealworm. If you can not get organic carrot at where you live, you may give them potato. But put a small piece paper towel underneath the potato slice to separate it from the growing medium to avoid mold issue. "I once briefly raised mealworms. They seemed to do well with oatmeal (I tried to give them the 'plainest' oatmeal I could find - no instant, salted, etc. For moisture, I used either sliced apple or potato. They seemed to do fine with either. I never thought about insecticides. I guess I was lucky, since my worms seemed to do fine. I didn't worry about separating different stages and always had new worms, so I don't know if they eat their own eggs or not, but enough survived to keep the colony going. I don't know about keeping them warm. Each species has a temperature at which they do best - the enzymes they produce to live have an optimal range of temperatures (usually a very narrow range) and the animal tries to keep body temperature within that range. Mealworm beetles are of Mediterranean origin and so would probably do well in the average temperatures of Mediterranean countries. Since you live in Georgia, the climate is probably similar to Mediterranean climates and so the beetles would probably do best at room temperature and would probably be fine (although inactive, as you have mentioned) in near-freezing temperatures. They may be stressed if kept too warm, although they would reproduce more rapidly, which would be important if you want to build up the size of your colony rapidly. I kept my colony in a big plastic jar. I used a dark plastic jar as the beetles prefer the dark and I think they were happier and less stressed that way. It had a lid that I usually kept open so they had enough air. I was afraid they would suffocate if I left the lid on, although it was handy to be able to screw it on tight briefly if I had to transport the colony. Periodically, as the frass and dead insects build up in your colony, you need to strain out the live insects, toss out everything else and put the insects in a jar with a fresh batch of oatmeal and sliced carrots. The frass (insect feces) looks like very small particles compared to the oatmeal, so if you see a lot of powder in there, it is probably time to clean out the colony. If it doesn't look too powdery, you can probably just put in more oatmeal from time to time. Good luck with your mealworms!" Update 2: on 2/7/2015 - As of today, I got 72 pupae, Yeah! 9 mealworms did not make it to the pupa stage. One thing I love about traveling is that I can learn a great deal of that country and their culture. Touring Costa Rica the first time, I picked few top eco-friendly destinations. La Fortuna was the first stop of my trip. It is a small rural city located just about 115 miles northwest of San Jose, Costa Rica's capital city. I love rural because vast wildlife present with least amount of human disturbance. The original name of La Fortuna was "El Borio" and it was changed to La Fortuna after the eruption of Volcan Arenal in 1968. 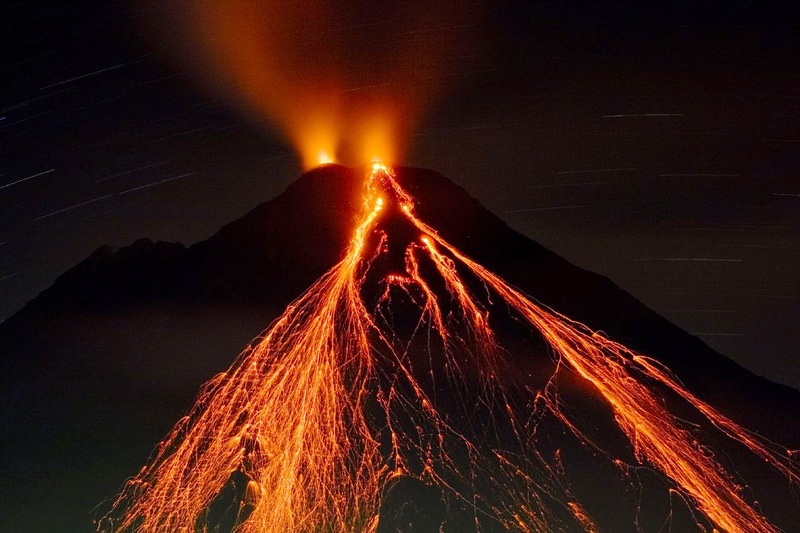 The eruption destroyed two villages located to the west side of volcano and El Borio to the east side of Arenal, was luckily untouched so it was renamed to La Fortuna, means "the fortunate". Tourists visit this city for the beauty of the volcano and its famous hot springs. There are many hotels and backpackers hostels in town and for my own purpose of "chasing birds", I chose a small, quiet, family-operated eco lodge just 5 kilometers outside the town. The image below is borrowed from wikipedia. So you know this is a serious "live" volcano. During my three days stay, I was not able to get any volcano shots because the constant rain. Continued from Part Two ... Who cares for volcano when you have these many colorful and cheerful birds and butterflies around you? I was "bombarded" by countless hummingbirds and I could not help but took this shot while sipping my coffee. So when I was scouting around Carlos's farm, I saw many banana plants, I asked Alan to take a photo for me. Carlos grows more than ten different types of banana on his farm. I asked Alan, "are they all edible?" He told me they only eat one type here, "We have plenty", Alan said, and "we leave the rest for birds and animals". Something more amazing I learned is that "banana" the edible fruit, is actually a berry from the banana plant. Most of us think banana is a tree, but they are actually a herbaceous flowing plant. After fruiting, the mother plant will die but the amazing thing is that she will leave many offshoots, which will continue to grow into many huge plants and produce many more bananas. I really admire how a humble farmer like Carlos and his family understand "sustainability". They cultivate their land heartily and they consider their surrounding and environment as their #1 priority. This is something USA should learn and teach children at school. Right before leaving Carlos's farm, I ran into a wild Red-lored Parrot. According to Alan's sister, this parrot fell from a nest few years ago, since they were not able to put this bird back to the tree its nesting hole, they kept her in a cage with no door under the carport. "No door?" you might ask. That's right, they removed the door so the bird could come in and out anytime as she wished. They told me sometimes, she will come home at night, sometimes she won't. But they will "call" her up by her name, lol, they called her "Barbara". It's funny to give a wildlife an American name. It suits her well because she "talks" a lot. I did not stay long enough to hear how she "talked". Alan tried to call this Barbara out for me but she never showed up until the day I was checking out. I love this photo of me and this "wild Barbara". She left me a lot of "souvenirs"... many scratches on my left arm and shoulder, ouch! They really hurt when I took showers :) But it was total worthy! So where are the mosquitoes? you might ask. Tropical rain forest country like Costa Rica with average yearly rainfall around 13 feet (yup, 156 inches or nearly 400 cm, OMG) must have a lot of mosquitoes. My friends back in the States reminded me to bring at least two big bottles of insect replant, the funny truth is that I have never used once during my trip. I eagerly wanted to find out where are those nuisance bugs to satisfy my curiosity. I asked Alan "did you guys spread any pesticide or bug spread on your farm? Where are the mosquitoes?" Alan told me " No, no, everything you see is all natural and organically grown. Yes, there are many insects, bugs and mosquitoes, but they got all eaten by birds, frogs and bats (Click this link to see the facts of amazing bats)!" Of the approximate 1,100 species of bats in the world, tiny country Costa Rica has taken 10% of that! Do you know a small Brown Bat can eat up to 1000 mosquitoes in one hour! This is a great result of biological control and sustainability working together! Pura Vida Costa Rica! Sustainable Mealworms for Forever Bluebird! If you don't know what they are...they are the pupae stage of the Darkling Beetles. Maybe you would be wondering why a vegetarian person raising these worms/insects? As you will see from title of this blog post, I am working on a small project called "Sustainable Mealworms for Forever Bluebird". My actual inspiration came from an ecolodge I stayed during my recent tour to Costa Rica. I got 10 pupae as of the morning of 1/28/15 ..I have feeling that I will get more tonight! This place is a haven for veggie lovers. I was so amazed to know that this is actually an organic garden! I caught this when I came home today and I was so excited and snapped a shot right away. ...I call it "halfway" pupa, it is in the transformation from it's 2nd stage (worm) into the 3rd stage (pupa)! Amazing! So when I returned home from my trip, Atlanta was in a deep winter. Here we seldom have snow but cold weather can drop temperature below freezing for days. For about a week, temperatures were 20 to 30 degree fahrenheit. All my backyard birds suffered from freezing weather not because the cold but because they could not find any drinking water. Water was frozen everywhere. I thought about buying one heating bird bath. But for the purpose of energy conservation, I dropped that idea. I have noticed not every bird will drink after eating. Eastern Bluebirds are exceptional. They love to drink after picking up the "dry" mealworms. If I were a bird, I think I'd do the same. "How could I eat that dry mealworm jerky?" my bluebirds might ask if they could talk, lol. Like everyone else, I too also feed bluebirds with store purchased dry meal worms :( Another alternative way is to buy live mealworms, but I would not be able to afford them for too long. So the idea of raising mealworms came to my mind one day. "What if I raise my own mealworms, bluebirds and many other birds would benefit from fresh, nutritious food with less water consumption!". But how? I had no idea and didn't know any single person in my life who raises mealworms! Wait! I just remembered my bother who lives oversea with his family had experience raising mealworms for their pet lizard. I immediately called him and he knew exactly what to do and gave me a clear instruction. Next thing I knew I got 100 live mealworms in my shoe box! When I first brought these babies home, they were cold, freezing non-moving. Can you believe store keeping them in a refrigerator, omg! I knew that was the best way not to feed them, yet kept them alive :( Alas! " So cruel", I thought. How can I judge others? Because my ultimate purpose is to raise them to feed my beloved birds. As soon as I bought them home, I "thawed" them out and kept them in an organic rolled oats medium. For the water supply, I feed them with organic carrots. Why I feed these mealworms everything organic?, you might ask. There is a story behind this. Once my brother's family visited my aunt who lives in a rural country side. He brought home with few green silk worms from my aunt's organic vegetable garden because I told him they will either become moth or butterfly (sorry I was and I am still not the expert in moth and butterfly). But after few days, they all dies because all he fed them were the vegetables he bought from local supermarket ...full of pesticides! Pesticides killed those little lives. :( So I learnt my lesson that I needed to feed my mealworm babies with the most clean food possibly I can. 1. How long will take from an egg (stage one of life cycle) to hatch into a larva, or the mealworm (stage two)? 2. How long does a mealworm live before transforming into a pupa? 3. How long will take a pupa "Metamorphosis" into an adult (4th or final stage of life cycle)? 4. Does a female beetle lay eggs all at once and then die? Or they re-mate? 5. Does a male mate with more than one females? 6. Will a female devour that male after mating? 7. How long will an adult beetle live? I read somewhere that adults will eat their own eggs so I have to separate all three stages from worms, pupae and adults. 8. 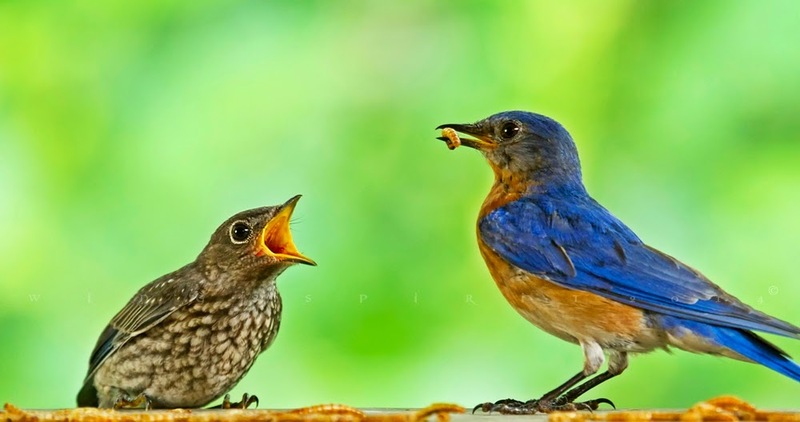 How many live worms a bluebird might consume in a day? 2/7/2015 Update 2: As of today, I got 72 pupae, Yeah! 9 mealworms did not make it to the pupa stage. Waking up in a total darkness, soon I found my iPhone and turned it on, "wow, it was only 4:55 AM!". So happy that I had a quiet (Last night's rain did not bother me at all), a total restful 7 hours of sleep! Birds already started chirping, humming and even " screaming", yup, all kinds of birds and they, most of they, were so new, so unknown to me. Some people are dreadful when hearing strange sounds, unease when exploring places of unknown, scared of foreigners or exotic food, and even more horrified to learn a new language. But to me, hearing, seeing, exploring, trying and even learning any thing new is a completely mind blowing and mentally challenging! " What does outside of my habitacion look like?, will I see toucans, any toucan?" 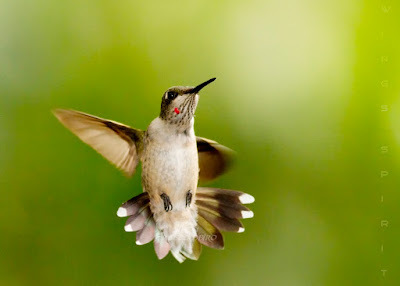 I thought and "how about hummingbird? how many hummingbirds will I see or photograph here?" I found my headlamp from my backpack that was the first thing I packed. If you ever want to explore Costa Rica, you definitely want to bring a good headlamp with you. A flash might do the job. The reason I chose to bring a headlamp in stead of a flash light was that so I can free my hands during my "night hike" :) Let me rephrase, I mean I need to hand held my camera :D . It was still too dark to explore. So I patiently waited for the dawn. Carlo's son Alan who speaks some English told me his dad made this farm a paradise! During all these years, he grew variety of plants and fruits. There were nothing here when they first moved here 24 years ago! Do you know Costa Rica does not have address! Even Costa Rica's president Laura Chinchilla (2010 - 2014) one time was asked if she knew what her address was. She just laughed and said she really doesn't know. Ticos (Costa Ricans call themselves Ticos) use distances from landmark to guide buses, taxi, police and postmen. Because they lack street names and they don't even bother to establish some. But one thing I noticed every where since I've arrived at Costa Rica was this word, "Bienvenido"! Every where is Bienvenido or Bienvenidos. I love this word and this is also the first Spanish word I learned from my Basic Spanish and now I saw it placed just outside my room! I got to snap a shot so I did! You probably have guessed, it means "Welcome". I already fell in love with Costa Rica and I knew it. I like Tico's relaxed life style and they even put a hammock outside each room. Don't worry, there are more than one hammock. You don't have to fight over one. You can stay inside my hammock because I will be chasing birds and butterflies all day long! Local people love this style of outdoor dining room. Ticos build a rugged dining room with simple material, a kitchen on one side and a huge, spacious, wall-less dining area under a huge tin roof to enjoy nature's everything. My mood was immediately infected by their ways of appreciating nature and wildlife. Alone travelor as I was, not lonely any more. "Every thing I need is here so close to me, dancing rain, floating butterflies , trembling flowers and indefatigable hummingbirds chasing each other all around me..." I closed my eyes, smiled and wished this moment could imprint inside my mind forever...., Time was not time, time was no longer recognized here. I lost in the ecstasy of my own fantasy. Soon I started noticing something even more amazing (that will be in the Part 3). Carlos's wife Aneil, who was the wonderful cook, asked me what do I want for my desayuno ( I love this word, i.e. breakfast). I swear that I told her this "dos toast y uno egg, cafe es bueno"...Photo below was what she made for me, to my surprise, with a large plate of fresh fruit. Lol, I think she made me two eggs with one toast and a pot of freshly brewed Costa Rica coffee! Who care! I am good as long as there is fresh coffee :) These fruit became so much more palatable when Alan told me except for the watermelon, all fruit I had in the morning was from here, grew right here on this fertile land, from this farm I "roosted" my weary body. Photography is my life. Though it was cloudy and rainy, how can a photographer walk around without a camera? That was the time when my spare camera, my smart phone, came handy! So please be patient with me, most "walking around" photos were taken from my beautiful assistant, iPhone, unless otherwise mentioned. I sacrificed my binoculars to be my model in the below photo to show you how huge this bromeliad plant is! In USA,bromeliads can grow in a pot, and indoor. Do you see they strive in Costa Rica! My mother was in a hospital during my field trip. I remembered how much mom loves flowers and I missed her a lot this day and wished she were with me. There are so many different kinds of flowers at Carlo's farm but I knew mom will like this orchid. So I snapped one shot and emailed to her and told her I love her. 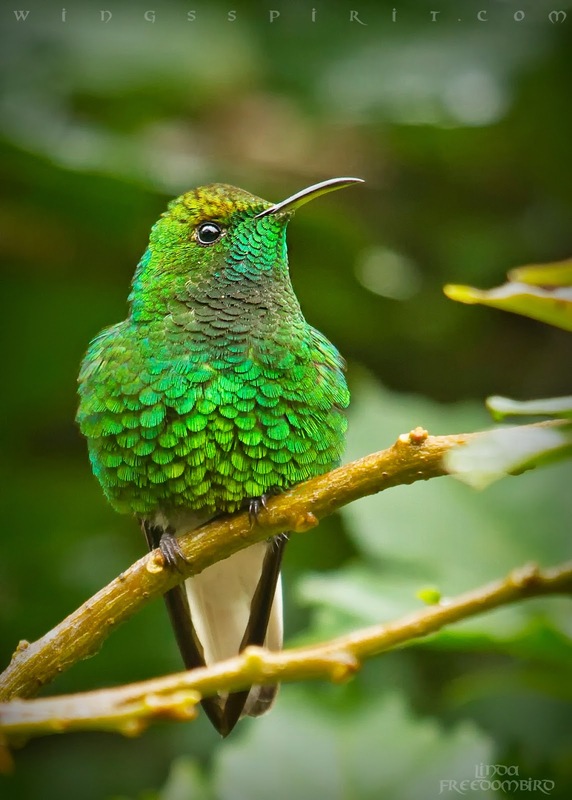 If you are a birder, you definitely know about the rich flora and fauna of Costa Rica. Non-birder tourists often travel to Costa Rica to enjoy some of the most beautiful beaches in the world. This tropical paradise has been always on my mind. With an estimate 1.5 million species- roughly 5% of all biodiversity on earth, 300,000 insects species, 240 mammal species over half of which are bats, 22 reptile species, 190 amphibian species and 130 species of fresh water fish, OVER 840 BIRD SPECIES.....over 9,000 vascular plant species, 1,200 orchid species, and 1,200 hardwood tree species ....the most impressive, each year dozens of new plant and animal species are discovered by scientists and thousands more likely await discovery! Often time, we give ourselves too many excuses not to explore a foreign land, such as language barrier, busy work schedule or negative opinion from friends and families. The questions I heard the most from others was like this " you live in a well developed country, why are you going to a 3rd world country?" "A third world country?" I replied and asked them "do you know according to the HPI, "Happy Planet Index", Costa Rica is ranking #1, the happiest country on earth?" Speechless them became. I work around my own schedule, I work for whomever I like and whenever I want. 840 species of birds really out weights other people's opinion. However, I have to admit I do have language barrier. I did not speak one word of Spanish! So naively, I thought English should be a common language worldwide :) The good news is that Costa Rica has the highest literacy (96.4%) among all Latin American countries. Most younger adults speak some English. My feet got itchy and my mind was flying higher and farther. A country with a profound love of wildlife must be a fantastic country to live! A huge world map hung on my living room wall and I always saw this tiny central American country and dreamed one day I would visit this country see one of the most amazing birds in the world, Resplendent Quetzal. 2011 past, I did not go. I bought a new 2012 Calendar, I marked "TO DO" in 2012 and I did not make my own goal. When I threw away my 2013 calendar, I consciously asked myself "Linda, are you a Freedombird? If you are, your wings are strong and ready! Go and Fly High!" One morning in April, I received an international airline ticket alert. The first destination on that ticket chart was San Jose Costa Rica. It was a spring morning, too much pollen in Atlanta. My eyes were blurred a bit. I wide opened my eyes and just read the email again, wanted to make sure it was not San Jose California. It was actually San Jose Costa Rica! Atlanta to SJO Costa Rica was on sale, indeed! In ten minute, I got a round trip ticket! "I am going to Costa Rica", overjoyed I was! Next thing I did was to start learning Spanish. I tired to learn Spanish about ten years ago and I gave up after two weeks, so hard, I thought :( But this time, I was determined. I bought a Spanish course with three courses from beginner to advanced levels. I spent my after work hours learning Spanish religiously and I found out this program was so easy to learn. By the time I was about to go on my trip, I have finished beginner level and could have simple conversation, I hoped. I was exuberant. The Birds of Costa Rica - this is an every birder's MUST HAVE bird bible. I studies it back home but I did not bring it with me in this trip, a big mistake. I downloaded an APP, it's called BirdsEye CA and it covers all the 1841 species of birds that you would see in the region of Central America. But the problem is most of national parks or preserves are located in rural area and there is not possible to get any data or cell phone signal. It's a great app but it will not work without a wifi. Costa Rica-The complete guide by James Kaiser . I was so glad that I brought this book with me in this trip and it helped tremendously. James lived in CR for five years and he writes well and he gives enough information for many birding sites, turtle nesting beaches, surfing playas, national parks and coffee area which is the area if you love coffee, you definitely don't want to miss. If you are like me, love eco-tourism, this book gives you a lot of good information about where to go to see different wildlife and where to stay or to eat. National Geographic Traveler-Costa Rica - the book starts with a detailed introduction to the country's history and culture. You are then guided thru each of the country's regions from the capital city San Jose, th elush Central Highlands, Guanacaste and its volcanoes, Nicoya Peninsula, the Central Pacific, Zona dur, the South Central and it's could forests, the Northern Lowlands and the Caribbean. This book also gives you detail information for snakes and butterflies. Plant guide of Costa Rica and The wildlife guide are two good books if you are into tropical plants and wildlife. SpanishDict app - it is a wonderful MUST HAVE app if you travel to any Spanish speaking country. No wifi required to use this app. It will pronounce for you if you have a wifi connection. I literally learned new words constantly and you can save new words into "favorite"! I learned over 300 new words in this trip! Cell phone - finding a telephone in any rural area of the country is nearly impossible. So you need to have a working cell phone with you. In the USA, most of phones are locked, that means the cell phone you have contract with does not allow you to use other company's (or other countries) service unless you unlock your phone. If you happen to be able to unlock your cell phone (do that before your trip and test out your phone with another sim card and make sure it will work). Then when you arrive at CR, you can just buy a pre-paid phone sim card inserted into your unlocked phone. "Kolbi" is the most reliable cell phone company in Costa Rica and they have the strongest signal even in the woods. I did not get Kolbi .... :( Another lesson learned. It's best to get your sim card at the airport Kolbi counter. There is no cell phone signal at any hotel I stayed during my trip. Because all eco hotels or hostels don't provide a phone or TV inside the bedrooms but you can use the phone from the reception desk. Local calls are always free. If your cell phone has wifi, you can install some apps, such as Skype, LINE or VIBER. That way you can keep in touch with your friends and families back home without paying huge international roaming charge. Money exchange (click to see the rates) - When you arrive at the Juan Santamaria International airport, you will see there have a money exchange area with many agents and they have a huge AD says " no exchange fee"! Don't be fooled by that because there is no exchange fee but the exchange rate is super low, like $1 USD = 438 Colones. It's best to use ATM machine. There are two ATM machines in this airport. The first one is to the right hand side as soon as you pass the immigration, and is always broken or malfunctioned. Just go a little further, you will see another one. Line is long, so be patient :) Most shopping centers, gas stations and hotels will take credit cards,both US dollars and Colones (Costa Rica money). I noticed all the banks in Costa Rica has their flag outside the bank and they all have an ATM. Or you can ask around. Ticos are very friendly and they will tell you where to find ATM. Don't worry, they have two languages (English and Spanish) choices. It's a good idea to exchange money before heading out the city. One thing I learned about renting a car was that if you want to only tour cities and beaches, a regular, compact-sized car is good enough. But if you are like me, want to explore many national parks, wildlife reserves, stop by rural towns and roadside tiendas to taste fresh local food and fruit, a 4X4 will do you a great service. I have never driven a 4X4 truck in my whole life, but I decided to hire a 4X4 and I was so glad I did. As you guys can imagine tropical weather with non stopping rains, harsh wind and heavy fogs, many unpaved roads could become muddy and slippery My car got stuck twice when I miscalculated and mistakenly parked car at a grassy shoulder lane to photography toucans and roadside hawks. I would never be able to make back on the roads if it was not a 4X4 SUV. Another thing is that most roads leading to national parks or less-known playas (beaches) are very narrow and winding, it's nearly impossible to turn around in the middle of the road without going all the way to the end. Just for you to know that, for a 37 km (about 30 miles) unpaved roads, it will take a good, skillful driver like me over 2 hours during the day with a good weather. Being say that, an automatic car is definitely the best choice than a manual one unless you can convince yourself that you will enjoy changing transmission non-stopping for two, three hours. One thing I miscalculated was the driving time. The condition of roads in Costa Rica was much worse than I expected. My flight arrived at 1:30 pm, after picking up my rental car, I gave myself enough time to arrive at my first destination La Fortuna, Aajuela before sunset, that is at 5:15 pm. The rental agent took almost an hour to pester me with his full coverage insurance (Be aware and also to be prepared to put an rental deposit from $500 to $2000). SoI did not start driving until around 3pm. With rains, fogs, unpaved gravel roads, by the time I checked in my hotel, it was about 6:30pm. I thought I can make to my hotel in less than two hours, but it took me 3 and half hour for a short 117 km. Another lesson learned. I was not a bit of upset at all. In my mind I was thinking "if Ticos (Costa Ricans call themselves, Ticos) visit our country, they might not get used to all the nice roads we have here in the US". I booked my first four nights of hotel back in the States and decided to leave the rest of my trip open. I gave myself three to four days to get used to the locals and figured out that what if I don't like the place I booked and I get stuck or if I like a place too much I might want to stay for more days....This is another great decision I made for this trip. Most people will book all the hotels before taking the trip because depending on the destinations, during high seasons, you might not be able to find vacancy easily. Costa Rican's busy travel time starts from Christmas, besides, I am all into adventure and this plan suits me well. So I can really take my time to explore this beautiful country. My anxiety and tiredness dissipated as soon as I inserted my room key into the door lock, turned my key to the right and opened my room door....this was what I saw! "WOW! ", was the first word came to my mind. It was raining heavily when I checked in. I did not have my rain poncho but I wore a boro boro sun hat and looked tired. Carlos, the owner of this family owned and managed eco lodging, did not speak English, greeted me by saying "Bienvenida, bienvenida! ", showed me my room and also showed me where the dinning area was. I followed him in the pouring rain walked another 300 feet from my room, then I found out they have an "outdoor" style dinning room. "Very cool", I thought, though I could barely see what it looked like in the dark. He told me desayuno (breakfast) will be served at 8 in the morning. I replied back to him with my embarrassing, newly learnt Spanish, "Muchas gracias, Carlos!" to thank him for showing me my room. He smiled and waived at me then told me to stop by the "recepción", his living room, if I needed any thing. Carlo disappeared in dark with his flash light, then I started inspecting my room everywhere, in between the sheets and pillows, underneath both beds, closet, huge bath room and ceiling to make sure there was no other "wildlife" staying in my room :) I took some photos (see above) and was completely satisfied. What a great news to know that Georgia's governor, Nathan Deal signed House Bill 881 INTO law on April 14, 2014 at Jekyll Island! 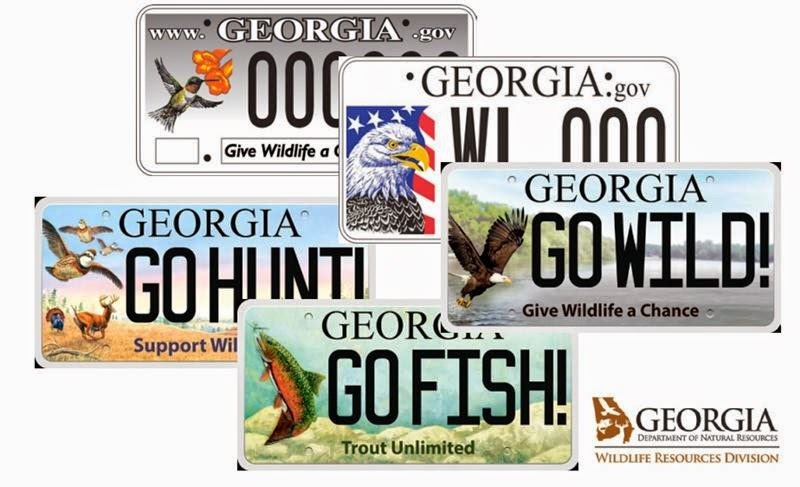 "The legislation rolls back the cost of buying or renewing a wildlife plate to $25 and dedicates more than 75 percent of fees to the Department of Natural Resources’ Wildlife Resources Division programs that depend on them. Passed in this year’s General Assembly and sponsored by Rep. Bubber Epps (R-Dry Branch) and Sen. Jeff Mullis (R-Chickamauga), the changes are scheduled to take effect July 1." I would like to give many thanks and great appreciation to all DNR peronnel and to the ones who support and to pass this House Bill 881 (what a lucky number of A DOUBLE 8) and with DNR Tim Keyes to send out this great news to all of us this morning! During my lunch break, I did a quick read for all the links Tim sent out in his email and I got few questions in my mind, "How does DNR conduct their research and work to protect these species and their natural habitats?" and " Where does the funding go towards educational and conservational purpose?" ...and I thought if you are like me, care for birds, wildlife and native plants and flowers, you will be so proud to know that the majority of all the money we donate to this nongame program or purchase and/or renew your wildlife car tag will go towards to this nongame wildlife program to protect 318 species that are endangered or near threatened. This is the link that will provide you a very good knowledge how Georgia DNR use the funding to protect Georgia's plants and animal species, including the birds we love the most such as protecting American Oystercatcher's nest on the Georgia coast and to restoring Sandhill Crane's habitat with prescribed fire just southwest of Macon and to re-establish over 160,000 acres Southern Pine forest for Red-Cockaded Woodpeckers. 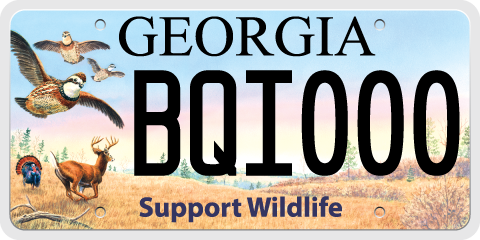 As a birder and wildlife lover, I would like to encourage all of you, birders, non-birders, friends and family of birders and non-birders, or flowers and plant lovers....all of you who love nature and wildlife to purchase a new plate for this year! The Wildlife Resources Division's Nongame Conservation Program receives no state funding to conserve Georgia's rare and endangered species and other nongame wildlife, as well as native plants and their habitat. Our contribution today will determine if we will see these beautiful birds, animals and the native plants in the future. Your small contribution will make a BIG difference! 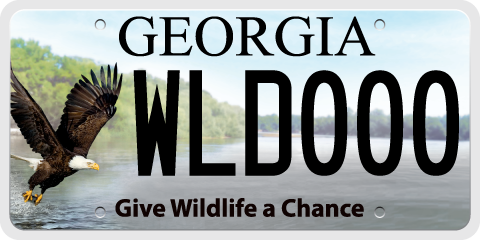 Just like the Hummer plate says " Give Wildlife A Chance".